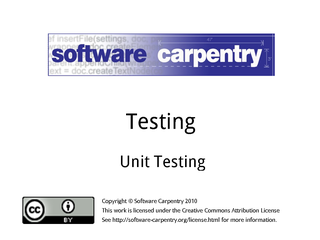 Hello, and welcome to the third episode of the Software Carpentry lecture on testing. 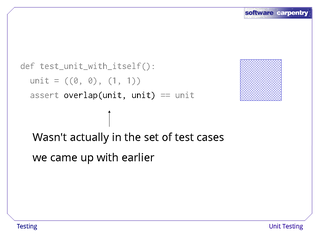 In this episode, we'll look at how to do unit testing a bit more systematically. 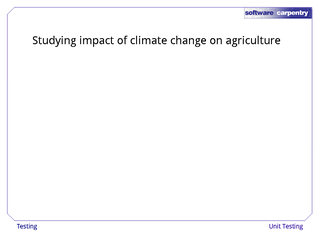 Our research group is studying the impact of climate change on agriculture. 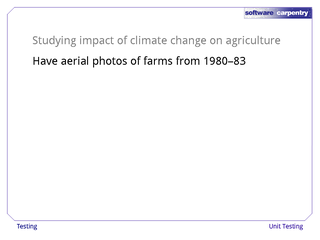 We have several thousand aerial photographs of farms taken in the early 1980s. 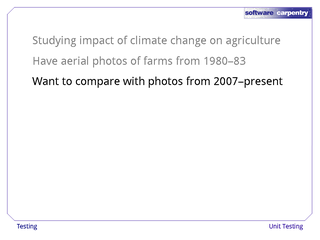 We want to compare those with photographs of the same fields taken since 2007 to see what has changed. 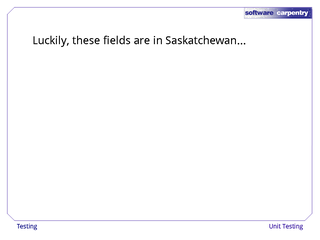 The first step is to find regions where fields overlap. 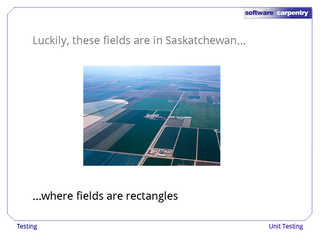 …where fields actually are rectangular. 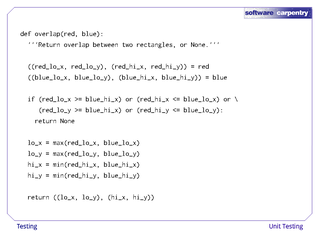 A student intern has written a function that finds the overlap between two rectangles. 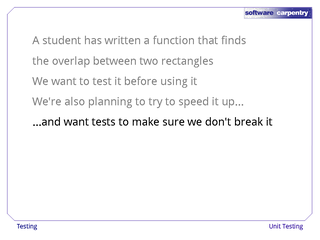 Having used student code before, we want to test it before putting it into production. 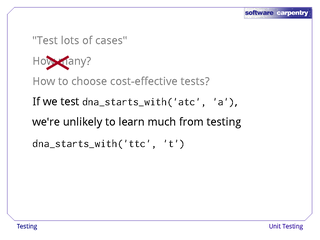 …so we want to have tests in place so that our optimizations don't break anything. 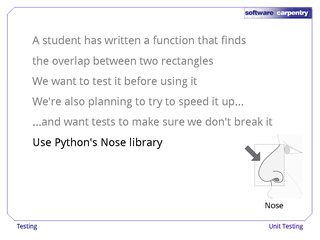 We're going to use a Python library called Nose to organize our tests. …whose name begins with the letters test_. 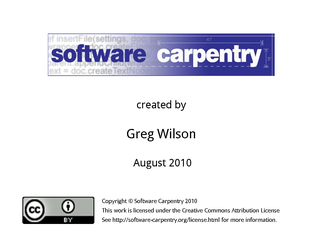 …whose names also begin with the letters test_. 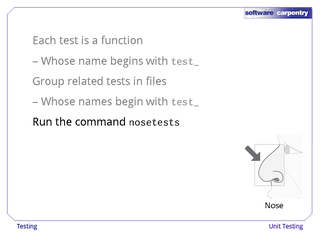 To execute our tests, we run the command nosetests. 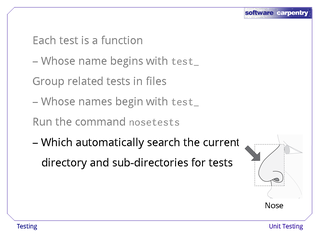 This automatically searches the current directory and its sub-directories for test files, and runs the tests they contain. 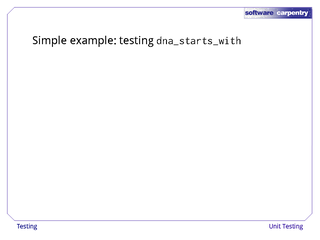 To see how this works, let's look at how we'd use it to test the dna_starts_with function from the previous episode. 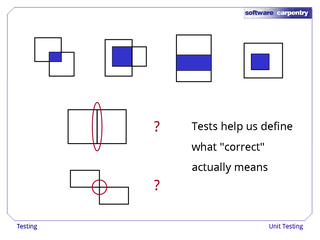 Here are our first three tests. 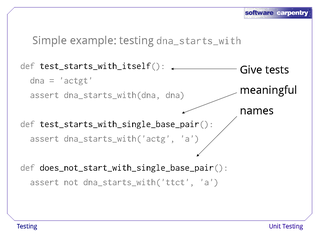 To help us understand our own tests, we give each function a meaningful name—something better than "test 1" or "test 2". 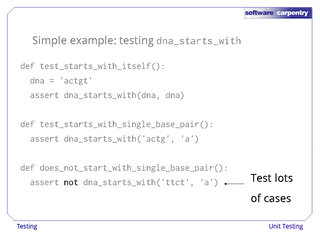 Each test function uses assert to check the result of a single call to dna_starts_with. 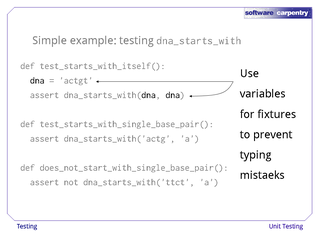 Test functions can create and use local variables, just like other functions. It's particularly helpful to put temporary values, or values that are used in several places, in variables to avoid typing mistakes. 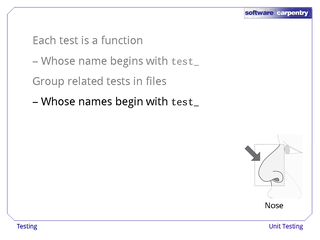 Of course, the Nose library can't think of test cases for us. We still have to decide what to test, and how many tests to run. …but how many is "lots"? It turns out that's not actually the right question to ask. 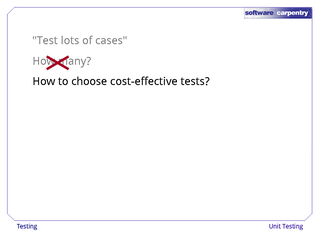 A better question is, how can we choose tests that are worth writing and running? 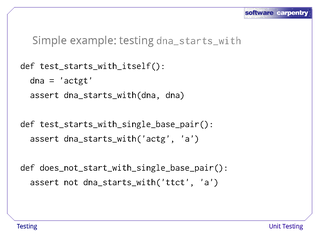 For example, if dna_starts_with('atc', 'a') works, there's probably not much point testing dna_starts_with('ttc', 't'): it's hard to think of a bug that would show up in one case, but not in the other. 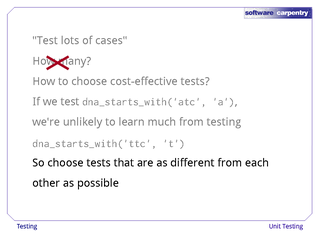 We should therefore try to choose tests that are as different from each other as possible, so that we force the code we're testing to execute in all the different ways it can. Another way of thinking about this is that we should try to find boundary cases. 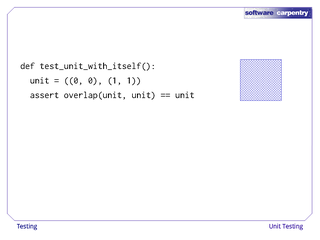 After all, if a function works for zero, one, and a million values, it will probably work for eighteen values. 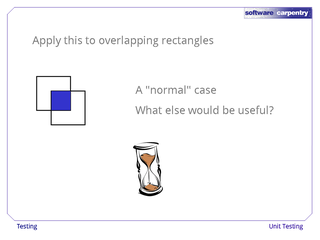 Let's apply this idea to our overlapping rectangles problem. 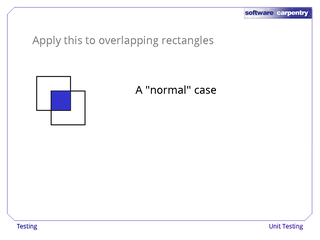 Here's a "normal" case: two rectangles that overlap by half in each direction. 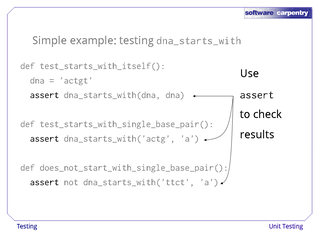 What other tests would be useful? Take a moment and see what other tests you can think of. Welcome back. 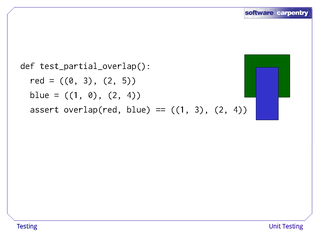 Here's our first test case: two rectangles that overlap by half in each direction.. 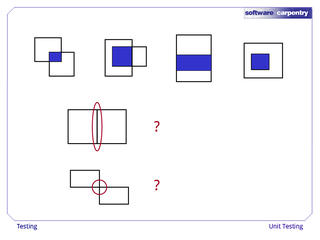 Here's our second: the rectangle on the left extends above and below the one on the right, so none of the corners of the left rectangle are involved. 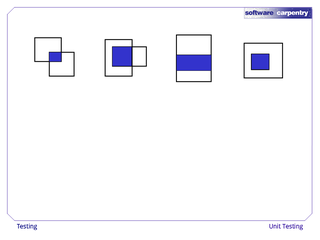 Here's a third case: the two rectangles are exactly the same width, but have different vertical extents. 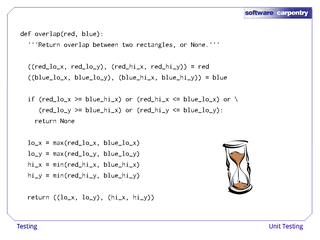 This will tell us whether the overlap function behaves correctly when rectangles intersect along entire lines, rather than just crossing at points. And here's a fourth case: the second rectangle is contained entirely within the first, so their edges don't actually cross at all. But what do we expect in this case? 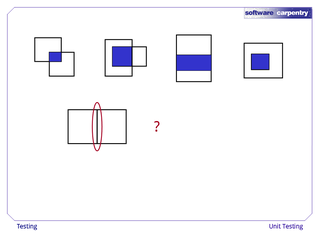 How should the function behave if the two rectangles share an edge, but their areas don't overlap? And what if they only share a corner, like this? 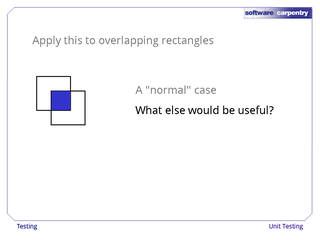 Should the function we're testing tell us that these rectangles don't overlap? Should it return a point, rather than a rectangle? Or should it return a rectangle with zero area? 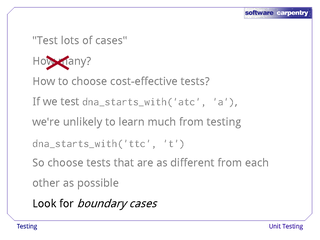 Thinking about tests in terms of boundary cases helps us find examples like this, where it isn't immediately obvious what the "right" answer is. 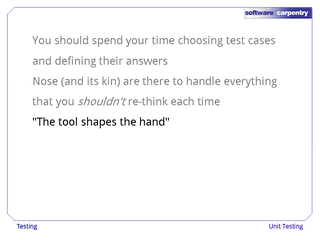 Writing those tests forces us to define how the function we're testing is supposed to behave—i.e., what correct behavior actually is. 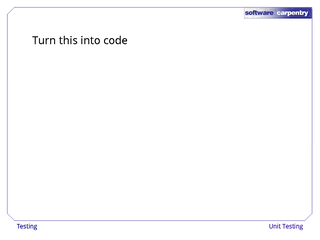 Let's turn all of this into working code. 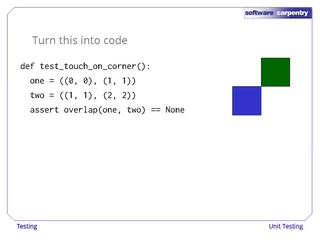 Here's a test for the case where rectangles only touch at a corner. 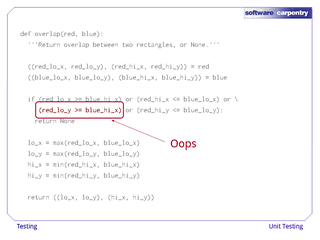 As you can see, we've decided that this doesn't count as overlap. Our test is an unambiguous, runnable answer to our question about how the function is supposed to behave. 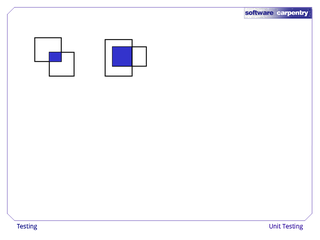 Here's our second test: two rectangles that have exactly the same extent, so their overlap is the same again. 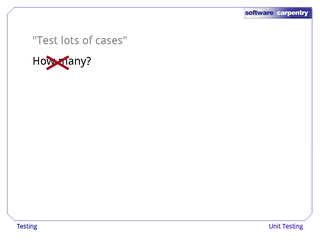 This wasn't actually in the set of test cases we came up with earlier, but it's still a good test. 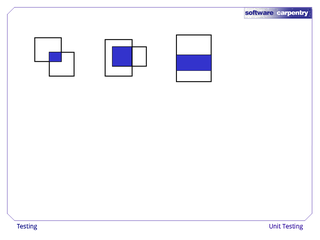 And here's a third test, where one rectangle is skinnier than another. This test case actually turned up a bug in the first version of the overlap function that we wrote. Here's the function. It takes the coordinates of each rectangle as input, unpacks them to get the high and low X and Y coordinates of each rectangle, checks to make sure that the rectangles actually overlap, then calculates the coordinates of the overlap and returns the result as a new rectangle. Take a few moments and see if you can spot the bug. 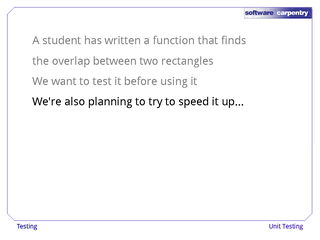 It's here—we're comparing the low Y coordinate of one rectangle with the high X coordinate of the other. This bug is probably the result of copying and pasting. Stepping back, the most important lesson in this episode isn't the details of the Nose library. 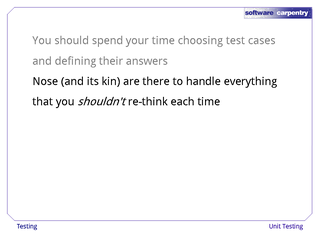 It's that your time is more valuable than the computer's, so you should spend it doing the things the computer can't, like thinking of interesting test cases and what your code is actually supposed to do. Nose and other libraries like it are there to handle all the things that you shouldn't have to re-think each time. 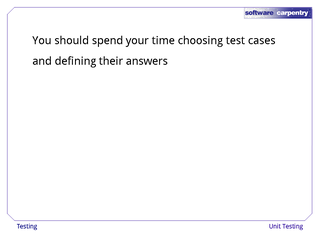 They will also help guide you toward good practices, to make your testing and programming more productive. In the next episode, we'll look at some of the other ways Nose can help you.